If the shoe fits wear it! People have worn protective foot coverings ever since they have walked long distances. Shoes cover our feet and protect them from rough ground, sharp objects and harsh weather conditions. 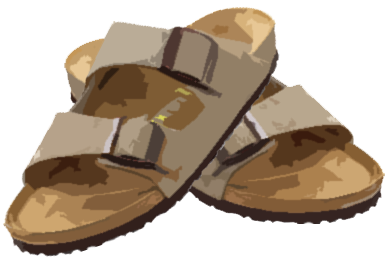 Sandals have been the most basic type of shoe in addition to wrap around soft-soled moccasins. Shoes protect and reveal character. Shoes tell about the person who wears them and the historical time and conditions in which they were worn. The shape helps tell how the wearer stands and walks, their economic and social status, values and styles of the owner. Shoes show our personality! Until 1850 most left and right shoes were made identically. Now shoes are made with four basic parts: upper, insert, midsole and outsole. How long does your shoe last and where do your old shoes go? Your shoes were made for walking! Activity 1 – If the Shoe Fits! How many pairs of shoes do you have? Get them out, line them up and count them. Make a chart of your shoes. Make small drawings on the left side of your paper. Label your columns: Use, Type, Materials, Maintenance, End of Life. 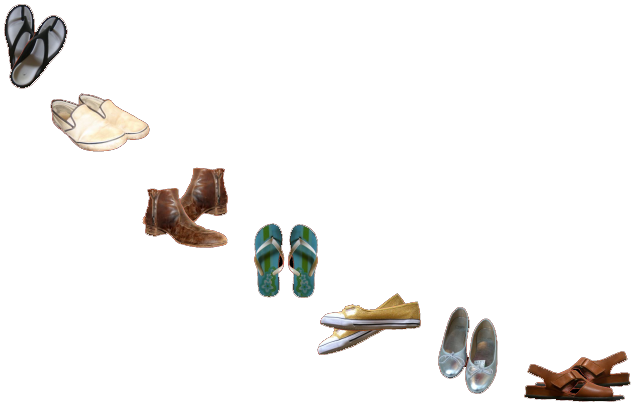 Chart each shoe as to its use: Dress, Casual, Sports, Water, etc. Chart each shoe as to its type: Slip on, Tie, Buckle, Snap, Velcro, Zipper, etc. List the key materials of each shoe: Leather, Rubber, Plastic, Cloth, etc. Tell what you do to keep the shoe in good condition: Wipe, Polish, Wash, Replace, etc. Finally tell why you stopped wearing your shoes and where will your shoes go when you have finished with them. How many shoes do you really need? Tread on the earth lightly. What makes a good tread? Take note of different tread prints. Make six different dirt prints on paper. Compare your tread prints with friends. Next draw the sole pattern of each tread beside the tread print on the sheets of paper. Compare the different tread patterns. What can you learn about the function of the shoe and the tread? 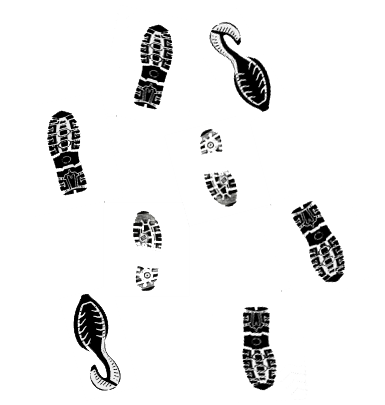 Pick one of the tread prints and redesign the tread. Be sure to design an upper with your tread pattern in activity 3. Think about a new look or a new type of shoe. What kind of shoes would you like to see that do not exist? Illustrate or draw shoes on people’s feet. Sketch out different ideas using different materials, different systems of closure. 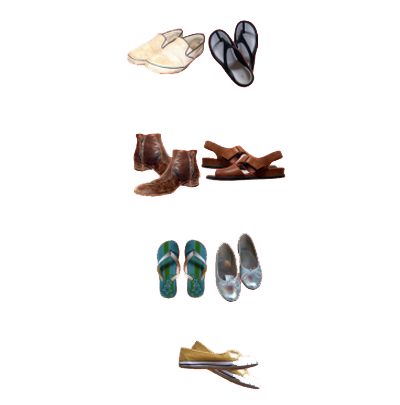 Be sure to draw the shoes from multiple views- top, side, sole or bottom. Share your shoe design with someone to get some feedback. What questions or concerns does your reviewer have? How will you adjust your design? Take notes, make sketches, envision new versions of comfort and style! The tennis shoe was an early form of footwear. The sole of the shoe protects our feet from wear. Some shoes are more comfortable than others. Shoe design responds to climate. World's Oldest Shoes...found in Oregon!